(Nanowerk News) Nanowires and nanotubes, slender structures that are only a few billionths of a meter in diameter but many thousands or millions of times longer, have become hot materials in recent years. They exist in many forms — made of metals, semiconductors, insulators and organic compounds — and are being studied for use in electronics, energy conversion, optics and chemical sensing, among other fields. Due to their extreme slenderness, both nanotubes and nanowires are essentially one-dimensional. “They are quasi-one-dimensional materials,” says MIT associate professor of materials science and engineering Silvija Gradecak: “Two of their dimensions are on the nanometer scale.” This one-dimensionality confers distinctive electrical and optical properties. For one thing, it means that the electrons and photons within these nanowires experience “quantum confinement effects,” Gradecak says. And yet, unlike other materials that produce such quantum effects, such as quantum dots, nanowires’ length makes it possible for them to connect with other macroscopic devices and the outside world. The structure of a nanowire is so simple that there’s no room for defects, and electrons pass through unimpeded, Gradecak explains. This sidesteps a major problem with typical crystalline semiconductors, such as those made from a wafer of silicon: There are always defects in those structures, and those defects interfere with the passage of electrons. In addition, materials that don’t ordinarily mix easily can be grown together in nanowire form. For example, layers of silicon and germanium, two widely used semiconductors, “are very difficult to grow together in thin films,” Gradecak says. “But in nanowires, they can be grown without any problems.” Moreover, the equipment needed for this kind of vapor deposition is widely used in the semiconductor industry, and can easily be adapted for the production of nanowires. 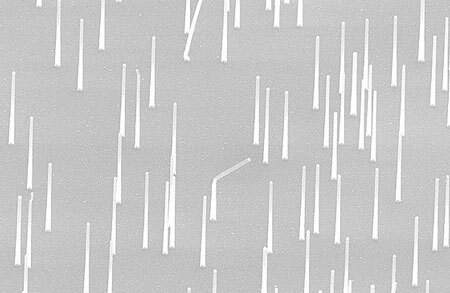 Similarly, nanowires’ shape can be used to produce narrow-beam lasers or light-emitting diodes (LEDs), Gradecak says. These tiny light sources might someday find applications within photonic chips, for example — chips in which information is carried by light, instead of the electric charges that relay information in today’s electronics. In addition to their useful electronic and optical properties, carbon nanotubes are exceptionally strong, and are used as reinforcing fibers in advanced composite materials. “In any application where one-dimensionality is important, both carbon nanotubes and nanowires would provide benefits,” Gradecak says.